Does Dealing With Your Chronic Disease Feel Like a Struggle? 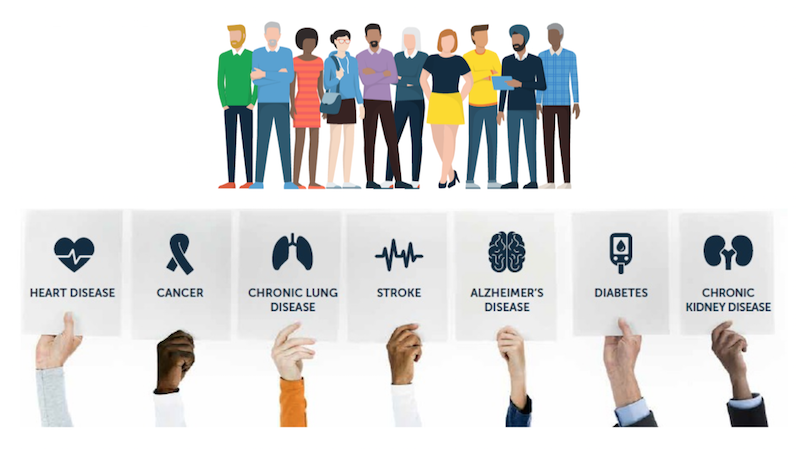 6 in 10 Americans have a chronic disease like heart disease, diabetes, asthma, high blood pressure, COPD, depression, arthritis, or chronic pain or another recurring condition. 4 in 10 Americans have two or more chronic diseases. How do you live well, day-to-day with your chronic condition? These are complex diseases that patients, not their doctors, have to manage.The vast majority of people who have trouble managing their chronic conditions aren’t lazy or unmotivated; rather they don’t know what to do–or how to do it. If you are one of those people then you know what it’s like to be sick with the kinds of illnesses people can’t see. If you’re not, it’s safe to say that you know and care about someone who is. You and your support network need simple, clear information about what to do to take care of your condition and how to do it. While you may spend dozens of hours with your health care providers each year, you spend more than 8,700 hours on your own, making daily decisions that affect your health. A chronic disease self-management program can give you the ability to make those decisions smart and healthful. The Living Well With Chronic Disease Self-Management Program can give you small, yet powerful steps to live healthfully — with guidance on how to take those steps. Where: Sunshine Community Health Center – Talkeetna Office, Mile 4.4 Talkeetna Spur Rd. Space is limited. Register early to ensure space, workbook, and supplies. Do You Feel Confused By Information Overload? Maybe you’ve been told to carefully monitor your calories and eat a good, balanced diet only to do that and still have trouble maintaining a healthy weight, cholesterol, blood pressure or blood sugar level? Understanding dietary changes, blood monitoring, and prevention of complications can feel scary with tons of details to remember. For a people with a chronic disease, sometimes it’s overwhelming to figure out what’s what. With so much information to process, it’s hard to keep up. The Chronic Disease Self-Management Program explains, in terms that you can understand, how diet and activities affect how you feel so you can take control of your condition and live a happier, healthier life! Does Constant Daily Monitoring Cause Stress or Anxiety? Do you get depressed about having to deal with your condition day in and day out? Do you worry about complications, get angry about the never-ending chore of self-care, or get frustrated by poor results when it feels like you’ve worked so hard? Chronic diseases heart disease, diabetes, asthma, high blood pressure, COPD, depression, arthritis, or chronic pain or another recurring condition can drag anyone down – from having digestive changes changes, difficulty sleeping, fatigue, weight management concerns, mental clarity and so much more. The Living Well With Chronic Disease Self-Management Program addresses not only your frustrations but also how burnout may contribute to poor self-care & later complications. Get tools to help you assess your current state of motivation and establish a successful plan of action for a healthier future. Hate Exercising or Have Trouble Making Time To Do It? Sure, some people might have the exercise bug ingrained in their daily lives. Other people, and you may be one, just plain hate to exercise. We know exercise is important, but sometimes it’s just hard to put it into practice nearly every day (as you’ve been told it should be done). Work, family and life’s responsibilities always seem to get in the way. Everyone should have some physical activity in their lifestyle. In this workshop, you’ll learn how to get more exercise by making the most of the activities that are already part of your daily life. Find creative ways to ease into more exercise, build an active lifestyle, create a fun, low-impact walking program, set realistic goals, and monitor your progress at the Living Well With Chronic Disease workshop beginning January 16th, 2018. Start the summer with a solid plan and the support you need to follow it! Do You Have Questions About Food, Nutrition, and Diet? It doesn’t matter if you just learned about your condition or if you’ve been living with it for years; a chronic disease like heart disease, diabetes, asthma, high blood pressure, COPD, depression, arthritis, or chronic pain or another recurring condition can turn your life upside down and leave you with a lot of stress about how to cope and what to eat. Do you want straightforward information with options that fit you and your individual needs and tastes rather than a more structured “one-size-fits-all” approach to dietary changes? Learn how your disease functions and how misconceptions can cause harm or make yourself worse. Knowing the truth will make you more capable in your care, better able to advocate for yourself. Family and friends that attend will be better able to support to those they love with chronic conditions. With the Chronic Disease Self-Management Program you can learn to make better choices in restaurants, the grocery store, and the kitchen; self-monitor food intake, activity, and progress; read food labels; distinguish appetite from hunger; navigate a restaurant menu or buffet; examine motivation; and more. progress while staying positive, and so much more. A workbook is included to help you start new goals, and fellow patients with chronic disease share personal how-tos. Space is limited. Only 13 spots are available so don’t wait. Register today. Enter your details in the spaces below.